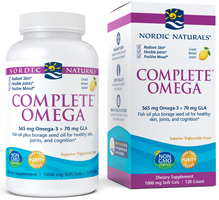 Complete Omega™ by Nordic Naturals, offers omega-3s from fish oil, omega-6 GLA from borage oil, and omega-9 oleic acid. This balanced blend promotes heart health, brain function, and a positive mood, and offers support for health joints and skin. Ingredients: (per serving) Omega-3, EPA, DHA and other Omega-3s - 565mg, Omega-6s - 240mg, Omega-9s - 225mg. Comes from purified deep sea fish oil (from anchovies and sardines), soft gel capsule (gelatin, glycerin, water, natural lemon flavor), borage seeed oil (borago officinalis), natural lemon flavor, d-alpha tocopherol, rosemary extract (a natural perservative). No gluten, milk derivatives, or artificial colors or flavors.